At Wag!, we create joy for dogs and those who love them. With hundreds of thousands of customers, our goal is to support and empower our community to create an environment where both Pet Parents and Pet Care Providers (Walkers, Boarders and Sitters) feel safe and supported while taking care of dogs and their needs. The following Community Guidelines are here to help facilitate a community-wide understanding of expectations and standards of conduct while using Wag!. By using Wag!, you agree to these guidelines and our Terms and Conditions. Violating these guidelines may result in loss of access to Wag! Safety is the foundation of our community. When Wag! thinks safety, we think across our four main constituents: the Pet Care Provider, the Pet Parent, the pup and the communities in which we operate. Wag! 's platform aims to provide Pet Care Providers with the information and access needed to support a safe experience while conducting a walk, sitting or boarding booked through Wag!. Before booking a new walk, boarding or sitting service, we encourage you to read the Pet Parent and pup profiles and have considered the information that's made available to you in-app by the Pet Parent. This will help ensure you’ve been paired with a pup that's right for you. If you have a question about a specific service you've booked, or if something does go wrong, it's important to communicate immediately with the Pet Parent or Wag! for swift resolution. Walk unassisted over the duration of a 30 or 60 minute walk, including entry and exit of the Pet Parent's home. Ascend/descend stairs while maintaining safe control of a pup. Readily leash and unleash the pup before the walk commences or when it has been completed. Maintain on-leash control of the pup (regardless of size). Navigate the features and controls of the Wag! app and perform the in-app actions associated with each walk (i.e., starting/ending a walk and any other inputs like taking a photo of the pup on a walk). Be attentive while performing a Wag! service, with full focus on the pup. Pet Care Providers who utilize the Wag! platform to provide pet care services should perform these services on their own. In the event that a Pet Care Provider brings another person on a walk, this person must be at least 18-years old and the Pet Care Provider should maintain control of the pup during the entirety of the walk and should not allow any third parties into the home of the Pet Parent. We encourage Pet Parents to communicate and engage with Pet Care Providers solely through the Wag! app or our website. Remember that Pet Care Providers may have questions and it is good practice to communicate directly when these questions arise. We encourage Pet Parents to keep their mobile devices close during a walk or boarding or sitting engagement. The Wag! app has user safety features that allow you to communicate with Pet Care Providers safely and conveniently. Use it! We also encourage Pet Parents to change lockbox codes often and not to share personal information, including phone numbers. When changing your lockbox code, also remember to update this information within the Wag! app to ensure upcoming Pet Care Providers have the information they need. Wag! wants every walk, or boarding or sitting experience to be as successful aspossible. We provide educational resources (like videos and blog posts) on the Trust & Safety section of wagwalking.com, in emails, and in the Wag! app. In the unlikely event that a pup is sick, injured or lost, we want to act quickly. Wag! is mindful that the Pet Care Provider is the one dealing with an incident in real time, but we are here to help. As a Pet Care Provider, contact Wag! as soon as you’ve learned that the pup’s health is threatened, the pup has come off leash, has been injured, or you’re experiencing another safety issue. The Wag! app and our website contain certain safety features that support our commitment to safety. For example, we’ve provided an "emergency contact" feature in the Wag! app that allows the Pet Care Provider to reach our emergency line or call 911 directly in the event the Pet Care Provider is experiencing an emergency and needs immediate help. Wag! also employs the use of automated logic and will send Pet Care Providers messages whenever outdoor temperatures become hot or cold enough that Pet Care Providers should exercise extra caution in providing a walk to ensure the pup’s well-being, such as shortening the walk in the extreme cold or bringing extra water in extremely hot conditions. Wag! takes user and pup safety very seriously; we do not tolerate the use of drugs or alcohol by the Pet Care Provider at any time while engaged in the performance of services booked through the Wag! app or our website. Wag! does not allow fraudulent behavior or activity on the platform, and will block users access to Wag! if suspicious activity is detected. Suspicious activity includes, but is not limited to, referral abuse, promotional abuse, and payment disputes. Here at Wag!, we take home access seriously. Lockboxes are provided to Pet Parents who request one. The use of a lockbox allows Pet Parents to securely store a house key for the Pet Care Provider to gain entry into the home to pick up and drop off the pup. In the event that a Pet Care Provider arrives and is unable to retrieve the key from the lockbox, it's important to know how to troubleshoot and work quickly to ensure that the pup inside gets walked on time, and that the Pet Care Provider is not late for upcoming walks. [For more information about common lockbox issues and how to resolve them quickly, go here]. We also encourage all users of the Wag! platform to keep their personal information safe. Keep in mind that Wag! support staff will never ask you for passwords or banking information. If you receive a suspicious call or text message, do not respond and contact Wag! support immediately. If there are issues with accessing the Pet Parent's home, the Pet Care Provider can tap on the "phone icon" and contact the Pet Parent directly. This action will send the Pet Parent a text message with the Pet Care Provider's inquiry regarding access. Note that both phone numbers will be anonymized to better ensure privacy for both the Pet Care Provider and the Pet Parent. Once a Pet Parent and a Pet Care Provider are connected through the Wag! app, the masked phone numbers will be active for 12 hours. 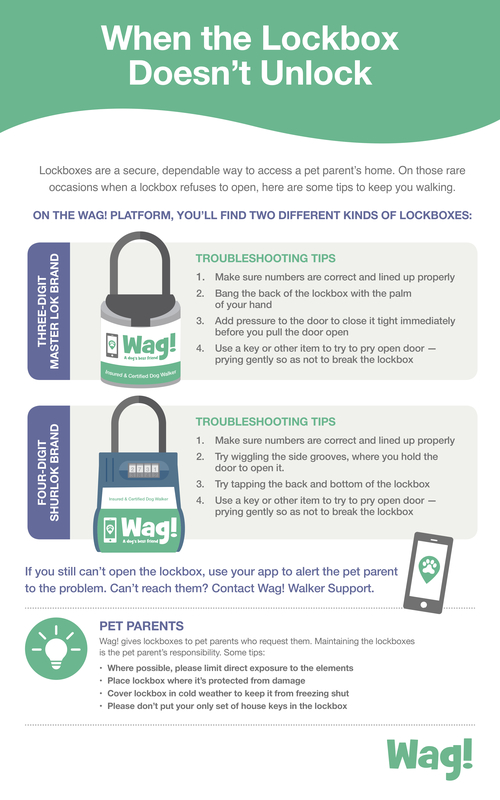 If the lockbox is not working or the home is otherwise not accessible and the Pet Parent cannot be reached, the Pet Care Provider can also contact Wag! through the Wag! app, and Wag! can also help troubleshoot the issue. Once the pup’s been picked up, the best way to ensure a Pet Parent's house keys aresecure during the walk is to place the key securely back in the lockbox at the start of the walk. Pet Parents should ensure the Pet Care Provider has smooth access to the home to pick up the pup. As a Pet Parent, be sure to provide information about accessing your home within the Wag! app or on our website. The Wag! app is the best channel for communication between you and your Pet Care Provider . As a best practice, ensure your pup's profile is filled out adequately, updated as needed, and includes any special details you may want to convey to your Pet Care Provider. Respecting others and their space is integral to the success of Wag! 's community and business. To avoid a negative experience, including ones that result in damage to either the home or other property, including the pup's leash, collar or harness, we encourage Pet Care Providers to make certain they understand how each Pet Parent expects their Pet Care Provider to carry out the requested service. Countless walks, sittings and boardings happen daily, and it's important to carefully read each Pet Parent’s profile to learn about their specific pup and their specific expectations. For Pet Parents, providing accurate and clear information in the Wag! app or on our website is important. Remember, like pups, each of us is unique and will have varying expectations of the other person. Being communicative and asking questions when you feel you don’t have enough information will help avoid misunderstandings of what is acceptable and what is not. A simple text or call can lead to a more successful experience. Use good judgment. At Wag!, we expect Pet Care Providers to conduct themselves in a respectful fashion when entering someone else's home. Carefully reading the Pet Parent's home access instructions will help facilitate a smooth experience. Wag! wants everyone to feel respected and comfortable while engaged in any of the service experiences offered through our platform. Remember, this is their home — you should only access areas that are designated as allowed by the Pet Parent, leave everything as you found it, and ensure the home is locked up during the walk and after you’ve brought the pup back home. While in a Pet Parent's home, regardless of the service you are providing, you should not take photos. A home is a private space and should be treated as such. The only exception is when the Pet Parent is expecting photo updates of the walk or sitting experience. Again, this is why it is important to the success of your experience to understand specific expectations each time you provide a service using the Wag! platform. Wag! supports an inclusive community and is proud to have people of different cultures, races, religions, and sexual orientations on the Wag! platform. It is unacceptable to use the platform in a way that is racist, sexist, ageist or discriminatory in any other way. If you feel you have been discriminated against, reach out to Wag! to report the incident. Remember that every Wag! user may have unique expectations. If you feel you cannot perform the service to their explicit instructions or otherwise feel you cannot complete the request, do not accept the walk, sitting, or boarding engagement. Anytime a Pet Parent and Pet Care Provider interact, whether within the Wag! app, on our website or in real life, the interactions should be informative, kind and respectful. We’re all here to bring joy to dogs and those who love them, as well as to one other. When walking a pup, you're expected to act in a manner that is considerate and thoughtful. You're expected to pick up after the pup, be respectful of areas where you are walking, and be mindful of those around you. The Wag! community depends on reliability, dependability and authenticity. To help ensure a successful experience with Wag!, Pet Care Providers should use every effort to be on time when performing a walk, or boarding or sitting engagement. Remember that pups look forward to these experiences. They and their Pet Parents rely on you to carry out the responsibility to which you’ve committed. Wag! employs a rating system through which Pet Parents may give you a star rating for performance and through which we can track tardiness, as well as missed and cancelled walks. Your overall Wag! rating will be affected if you're consistently unreliable. The Wag! app also allows Pet Parents to tip Pet Care Providers for good service – remember that the more reliable you are, the better your chances of receiving a tip. At Wag!, we expect that walkers, boarders and sitters are who they say they are. Under no circumstances should you allow a friend or family member to carry out any service on your behalf. We also do not make our service available to anyone under 18 years of age. Reliability is important for Pet Parents, too. Be sure to keep your home access information updated and accurate. Be sure to communicate directly with the Pet Care Provider in a timely manner if they reach out to you with questions during a booking. And if you’re dropping off your pup for a boarding, be on time and respect the agreement you've made with the boarding host.